The Texas Stars completed a series sweep of the Oklahoma City Barons tonight with a 4-2 regulation victory over the visitors. After winning both in OKC, the Stars needed a single win to close out the Barons and move on to the second round. It seemed like the closest a series could be and still be a sweep. 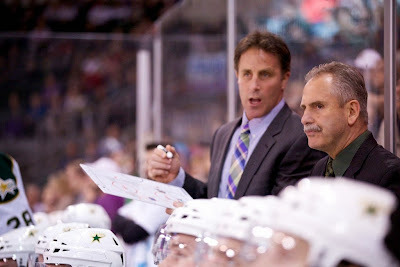 "It was close," agreed Coach Desjardins. "Both the games in OKC could have gone either way, and it was close tonight too. Tied in the third, you can't get much closer than that." Texas opened up a lead in the first period on a Brendan Ranford goal, his second of the series. 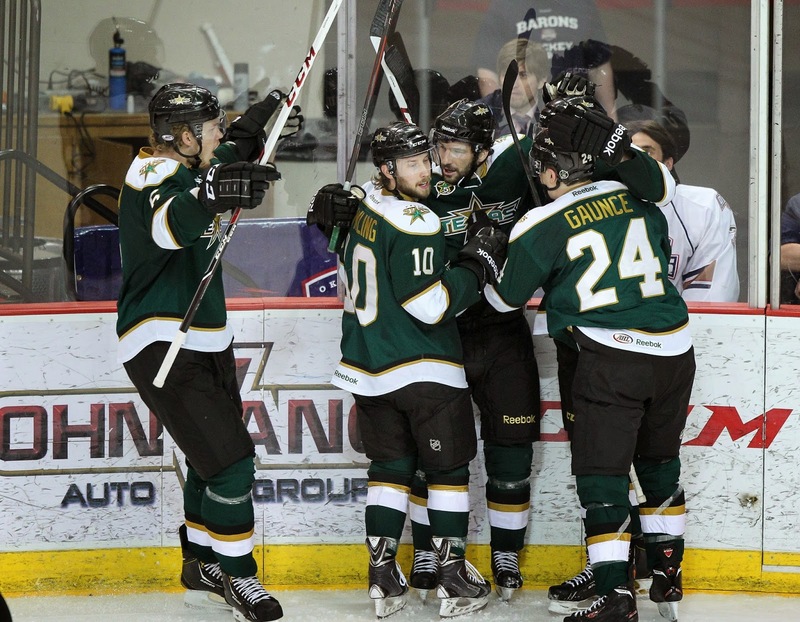 It was the first lead the Stars had held in the series after trailing in both previous games and winning in overtime. "I haven't heard of that too much," said Justin Dowling. "Where you're up 2-0 and you haven't had a lead yet." The game looked to be mirroring the contests in OKC as Texas put up a 2-0 lead and then OKC mounted a comeback to even terms in the third period. This time, Texas would not need overtime to end the contest. After being frustrated on the power play all night, the Stars scored on their eighth opportunity of the game, a 5-on-3 chance, off the stick of Justin Dowling. With nine minutes left in the game, the Barons worked to tie the score but could not get the goal they needed. With just over a minute left, Coach Todd Nelson pulled Richard Bachman for the extra attacker. The Stars gained control and Scott Glennie deposited the puck into the empty net for the 4-2 final. The Stars completed a series sweep for the first time since their inaugural season with the win. 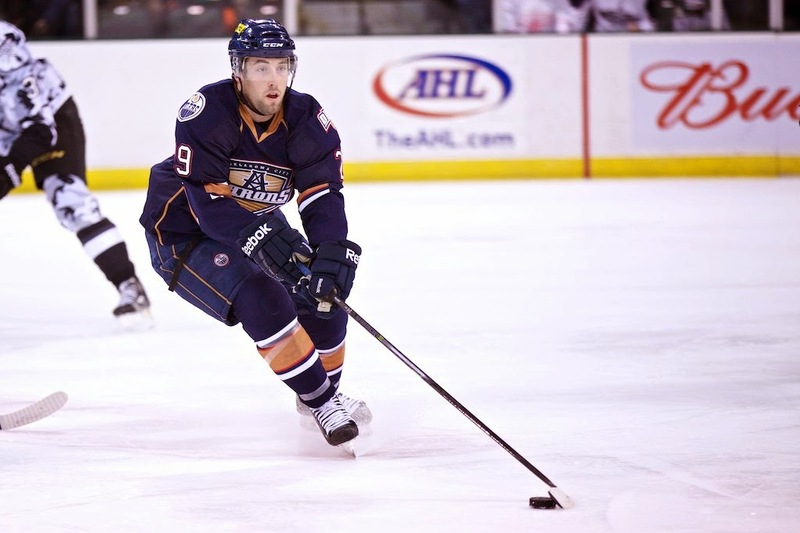 In 2010, Texas won swept their opening round, seven-game series against the Rockford IceHogs. Coach Todd Nelson had some kind words for the club as they move forward to the second round: "[Coach Willie Desjardins] can roll four lines and doesn't have to be worried about matchups. Moving forward, they have a great opportunity to see this through right to the end, and we wish them the best of luck." Texas opened the scoring in the first period. The top line delivered again with Travis Morin working hard along the goal line to retrieve a puck. He slipped it over to a hard-charging Brendan Ranford, who tapped it home off the quick pass for the 1-0 lead. "It was a really good play by McKenzie to push the defense back," said Ranford. "He got it to Morin and we all know how good Morin is. He made that pass look pretty easy. I just had to put it into the open net." The Stars continued their scoring ways in the second period. 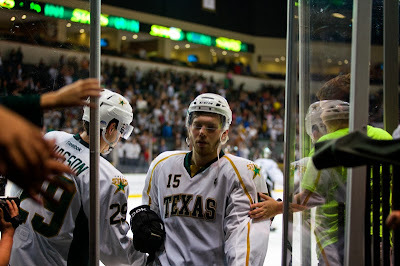 Recent assignee, Chris Mueller, re-introduced himself to the Cedar Park faithful with his first of the postseason. He managed to get around the OKC defense off a nice pass from Toby Petersen. In alone, he beat Bachman high for the 2-0 lead. "I owe it to this team to come down and help them," said Mueller of his role as an assignment from Dallas. The power play had issues for the home team in the second period. It went 1-for-10 on the night overall and allowed a shorthanded tally in the frame. OKC had a talent for picking up goals down a man in the regular season and showed why on the Stars' fourth PP of the game. Captain Anton Lander completed a 2-on-1, beating Cristopher Nilstorp five hole to cut the clear to 2-1 after forty. Mueller intoned, "They did a good job of sealing lanes and blocking shots. We just have to clean it up." The Barons got the tying goal in the opening minutes of the third period. Brad Hunt found twine from the point through traffic for the two all score. Hunt would give it back by taking a four-minute minor for high sticking Mueller, generating a Stars 5-on-3. Dowling narrates the play, "I was looking back door for Hedden's stick and if it wasn't there I was looking for Glennie. I saw Bachman just kind of stand up. If he got a piece of it, it would just be sitting in the crease and someone could whack it in. I saw him cheating so I tried to slide it in." He got it past Bachman for his first of the playoffs with just under nine minutes left. Soon thereafter, the Barons had a chance at the equalizer on a 2-on-1. Vet Mueller backchecked hard to hook the Barons forward and end the chance. "Anybody in my position would have done the same thing. That was desperation and I guess it's a good penalty to take." Texas played a strong puck possession game through the final minutes and earned Scott Glennie an empty net goal. The second round schedule and opponent are yet to be determined. The series will start on Cedar Park Center ice likely next Wednesday or Friday. Nemeth was a late add. Coach Desjardins indicated he would have played in case of a Game 4. UPDATE 1: OKC's Arcobello, Texas's Ritchie out. Gaunce, Glennie, Mueller, Jeffrey in. Troock, Vause, Peters, Guptill, and Labrie likely scratches. Nilstorp in net. UPDATE 2: Nemeth has been assigned but unclear if he will play. 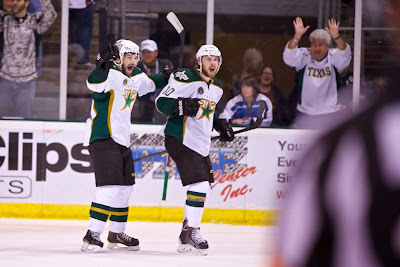 Coming home up 2-0 was obviously the best case scenario for the Texas Stars. They now have three games at home to get just one win over the Oklahoma City Barons and close out their first round series. Coach Desjardins admitted that they would have been pretty happy with a 1-1 outcome in OKC and went further saying they were lucky to get it after being down in both games. The Stars trailed 2-0 in Game 1 and had to tie up two one goal deficits in Game 2 before breaking through in OT in both games. Texas has yet to lead for any actual game time in the series. On the OKC side, Mark Arcobello is still questionable. He has been skating and we will know more as the day progresses. Barons morning skate is after Stars' skate. By noon, there will be more informaton on his status. Arcobello is confirmed out. You'd have to think that facing elimination you would take Mark Arcobello at less than 100% because that is probably better than the player you would replace him with. On the Texas side, Brett Ritchie is still questionable for the Stars. With the series lead at 2-0 and a chance to clinch tonight, Ritchie is unlikely to return in my estimation. Why push to get a 90% Ritchie into the lineup when you could just as easily win the game tonight without him and get a 100% player to start Round 2? Further to the above point, Texas will get Scott Glennie back following his one game suspension for boarding. That combined with the solid performance of Brenden Troock on Saturday takes some pressure off the return of Ritchie. Even more pressure is removed by the return of Chris Mueller and Dustin Jeffrey from Dallas. 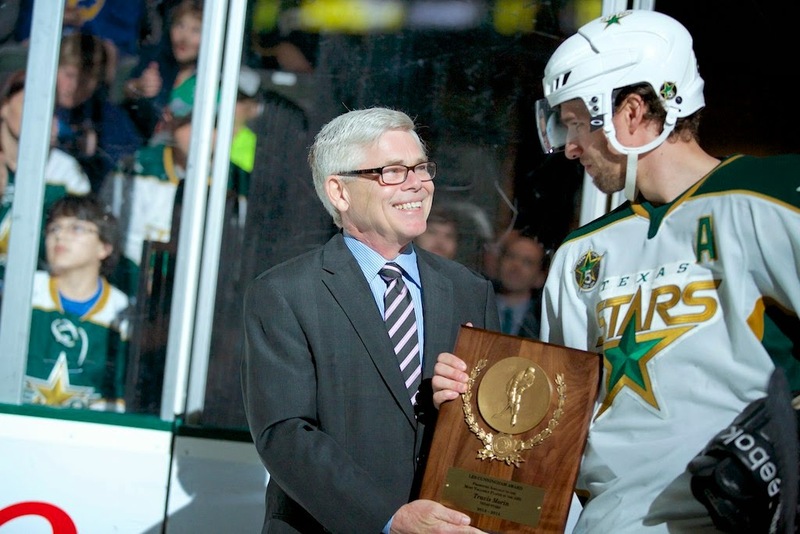 Mueller played in three of the Stars' six playoff games, and Jeffrey did not suit up for any. Both should enter the lineup Wednesday. Texas's mid-season veteran rule issues will not be a barrier here as Colton Sceviour and Francis Wathier are not in the lineup anymore. The only other player likely to return to Texas is Patrik Nemeth. The second-year Swedish blue liner played a lot of meaningful minutes for the Dallas squad down the stretch and in the playoffs. He missed Game 5 with an injury but played in Game 6. In all likelihood, he was playing a little hurt still. Similar to Ritchie, it's probably best to rest him up until Round 2 and then place him in the lineup. That, of course, assumes he will be healthy enough and Dallas will assign him. It is likely he will be assigned since this will be valuable playoffs experience the Dallas organization hopes he can build off of next year with the NHL club. He is waiver exempt now so there is no issue with that. Finally, Cristopher Nilstorp should start in net, given the rotation Desjardins has put in place. He was great in his last start, stopping 26 of 28 shots and getting the OT win in Game 1. Idaho goalie Josh Robinson made 83 saves on 85 shots, tying an ECHL record and closing out the Colorado Eagles' season with a win in Game 6. The Steelheads and Eagles set a number of records in the game. The contest was both the longest in real time and game time at 5 hours 42 minutes and 137 minutes and 18 seconds, respectively. The 151 total shots on net set an ECHL record. As the hour neared 1 AM in the Treasure Valley, the few hundred remaining fans saw David deKastrozza put home a Gaelan Patterson pass for a 3-2 victory. Texas-contracted defenseman Russ Sinkewich had a beautiful keep on the play, earning the 'third assist'. The celebration on the ice after the goal was part jubilation, part relief, and part shock for Idaho. For the Eagles, it marked the end of their season, and some of their players just collapsed on the ice in exhaustion. At the end of the day, this was a very entertaining series that could have gone either way and the Steelheads were able to bury just a few more shots at the right time to get the series win and advance in the playoffs. On to the Conference Semi-Finals which start Thursday up in Alaska. More on the schedule later in the week. Following last night's deflating postseason defeat at the hands of the Anaheim Ducks, the Dallas Stars have already begun the process of fortifying the Texas Stars for their playoff run. In all, four players are eligible to be assigned to Texas for the playoffs: Colton Sceviour, Dustin Jeffrey, Chris Mueller and Patrik Nemeth. Sceviour will not be assigned because he is likely to be climaed on waivers, as discussed here. Nemeth is waiver exempt and can be assigned freely. Finally, Jeffrey and Mueller must pass through waivers but are unlikely to be claimed. Darren Dreger reported this morning that both had been placed on waivers. If they clear, we will know tomorrow at 11 AM Central and they will be available for assignment to Texas. Stars place D.Jeffrey and C.Mueller on waivers. 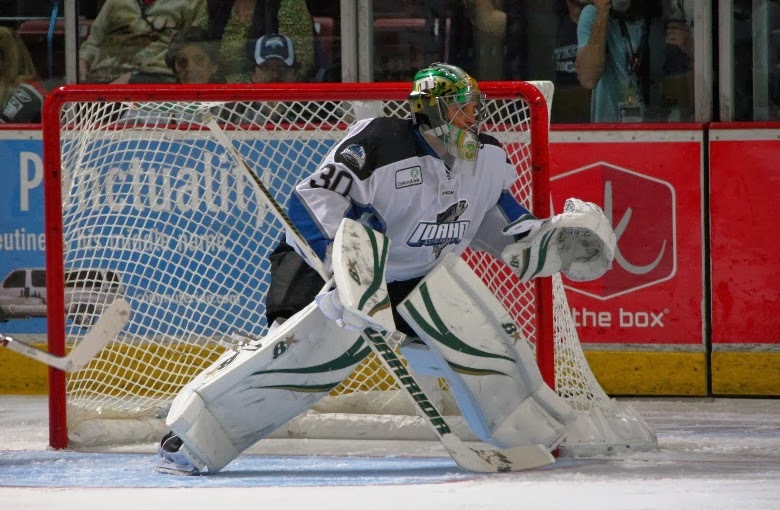 The Idaho Steelheads turned in their best defensive effort of the series as Josh Robinson returned to the net stopping 27 of 28 shots. Brett Robinson and Gaelan Patterson each got their second goals of the series as the Steelheads win 2-1 to took a 3-2 series lead in the best-of-seven opening round. Brad Ralph ran a a one game experiment in game 4. Pat Nagle, after turning in a winning performance in game 4, found himself back on the bench for game 5. However, the changes that the team made in front of Nagle during game 4 carried over to game 5 with Josh Robinson back in net. Idaho was finally able to outshoot the Eagles by a count of 31 to 28, but the number of shots that were forced wide or blocked by the Steelheads defense went up considerably. The Colorado Eagles made a couple of lineup changes. The most significant change was starting their season-long number one goaltender, Marc Cheverie, in place of Dustin Butler. Cheverie had been injured over the last month of the regular season. The Steelheads wanted him to make up for lost time as they peppered him with 14 shots in the first period, a majority of them of high quality. Unfortunately for Idaho, after a period that could have had them up three or four, they had to settle for a 1-0 lead after the first period. Brett Robinson would get the first goal of the game for Idaho after an outstanding sequence in the offensive zone. Rob Linsmayer and Patrick Cullity made great plays to keep the puck alive in the offensive zone. When Robinson was able to get control of the puck, the tired Eagles defenders allowed Brett Robinson to find a soft spot at the bottom of the right wing circle and pick his corner to put the Steelheads up 1-0. Despite allowing the one goal, Cheverie was outstanding the remainder of the period. He was able to turn aside a William Rapuzzi breakaway opportunity as well as robbing Mitch Wahl on a chance later in the period. The most important stat from the first period besides the goal was that the Steelheads were able to pressure the Eagles while only allowing three shots. In the second period, neither team was able to score despite the Steelheads having an extended 5-on-3 penalty kill during the later stages of the period. Also it looked like Rapuzzi scored a goal late after Cheverie appeared to slide back into his net on his own after making a save, but with the puck underneath Cheverie and Pierre Lambert still working on his x-ray vision, Lambert had no choice but to not credit a goal as there was no clear view of the puck crossing the goal line. For the second straight period the Steelheads would outshoot the Eagles 12-8 in the period. Josh Robinson had his best period of the night in the third. The Eagles came out pressing knowing that they needed a goal to tie the game. However it was a faceoff win by David deKastrozza and a nice finish by Gaelan Patterson that put the Steelheads up 2-0 just 5:13 into the period. While the breathing room was nice to have, there was still a lot of time left in the period. The Eagles would make the most of the third period by directing 17 shots on Robinson during the period. The team defense was outstanding as they kept the majority of the chances to the outside and when the Eagles found a good scoring area, Josh Robinson was able to make the stops. The only flaw on the game and period came with three seconds left in the game as Brock Nixon would find himself all alone in front of Robinson and was able to redirect a shot past the goaltender to spoil the shutout. Game 6 is set for Monday back in Boise. The Steelheads will have a chance to close things out and advance to the second round where the Alaska Aces wait for the winner of this series. Top-seeded Alaska swept the Las Vegas Wranglers four game to none. If Colorado wins on Monday, there will be a game seven on Tuesday, also in Boise. Expect to see Josh Robinson and Cheverie back in net for their teams as both of them played well enough to win in game 5. One of the most impressive things to me during the length of this series, is that for two teams that love to get up and down the ice and put pucks in the net, both the Steelheads and the Eagles have turned an eye towards defense, and because of that, this had been of the most entertaining series of the playoffs so far. Elsewhere, the Bakersfield Condors advanced past the Utah Grizzlies four games to one, and they will play the Stockton Thunder who got past the Ontario Reign four games to none. 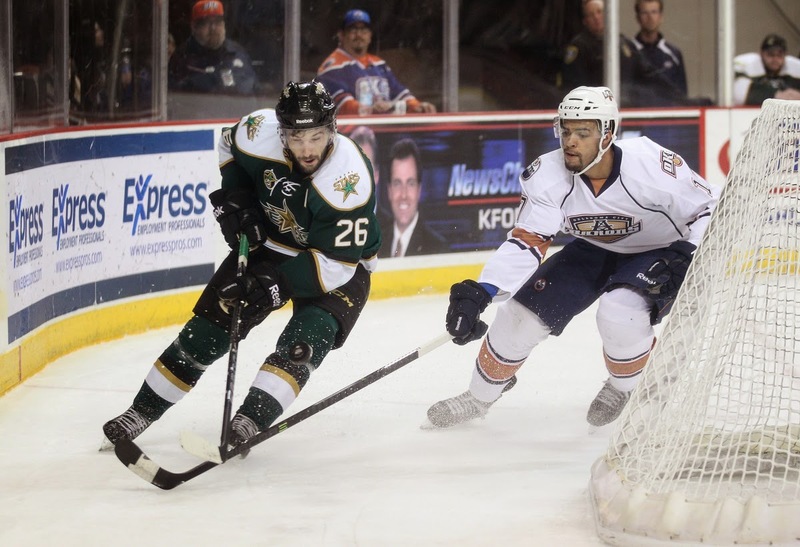 Another game in OKC came down to overtime and again it was the Texas Stars emerging victorious. 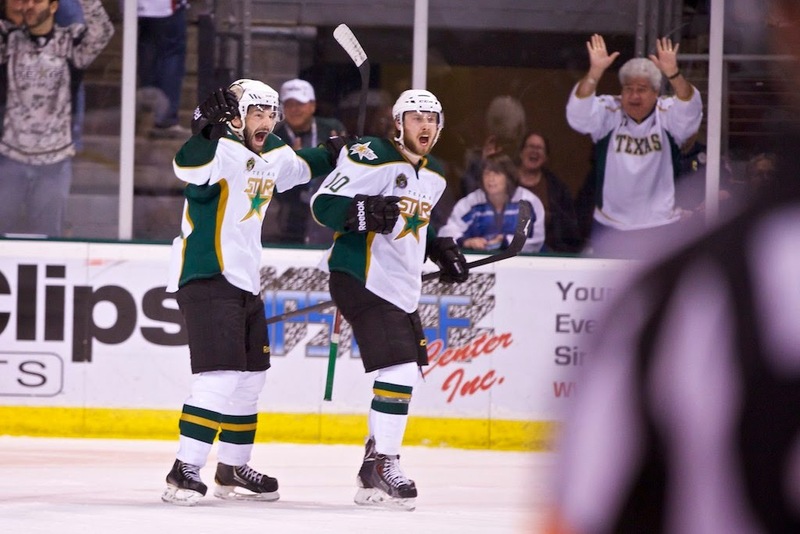 Brendan Ranford scored in the fifteenth minute of the first overtime, his first goal of the playoffs, to put the Stars up 2-0 in the best-of-five. "Both games were OT, so we could be down 2-0 as well," said Coach Desjardins. "We're really fortunate that's it's 2-0 and it's probably fair if it were 1-1. We didn't get lucky; we just worked hard." One of the hardest workers on the ice was the eventual game-winning goal scorer, Ranford, who received spears, cross-checks and other malfeasance throughout the game and battled through. "Coming in at the start of the year, you wonder if he's going to make the team. Here we are in the playoffs, and he's on our top unit. It says a lot." Travis Morin put up three points in the game including a goal in the final minute of the second and third period. His goal in the third tied the game at two to send it to OT. Jack Campbell got the start, as dictated by the rotation, and stopped 38 of 40, earning third star. Campbell said, "I've been waiting for this for a while and I'm glad I was just able to get in there and help the team." The Barons got off to a hot start once again, leading the shooting 5-1 early in the first period. It paid off 5:40 into the frame. Texas's Mike Hedden was blockaded by Richard Bachman on a point blank chance, which sent the play the other direction. Roman Horak picked up the puck behind the defense and picked a corner on Jack Campbell for the 1-0 lead. Coach Todd Nelson played the line of Will Acton, Ben Eager and Curtis Hamilton straight up against the Stars' top line of Travis Morin, Curtis McKenzie and Brendan Ranford. It was effective lineup management for the Barons' bench boss. They frustrated the AHL Rookie of the Year and MVP, limiting them to just one shot and taking Ranford off the ice with matching minors in the first. "They were playing us hard," said Ranford. "But that's what playoffs are all about. Willie told us to get more engaged in the plays. We didn't want to fold." Desjardins added, "There's a physical challenge there, and you have to meet it. If you don't meet it, you lose." As the second period wore on, the Barons led Texas in shots 13-7 when the youngster Darnell Nurse was called for a cross-check on Mike Hedden late in the frame. On the ensuing power play, it only took 3.8 for the Stars to cash in. Travis Morin won a faceoff clean forward against Will Acton and beat an unsuspecting Bachman for the tie at one all. As the period ended, Brendan Ranford took a shot from Ben Eager and needed help to get off the ice. He returned in the third period. COming down the stretch, Jujhar Khaira appeared to put it away for the Barons with a rebound effort for his first pro goal. Khaira knocked down the rebound of his initial shot with his glove and then scored off the backhand up high on Campbell's glove side. With 2:13 left in the period, it looked like the Stars would earn a late power play for the change to tie things up. Instead it was matching minors that opened up the ice to 4-on-4 hockey. It ended up being a fortuitous call for Texas. With Jack Campbell pulled for the extra attacker, 4-on-4 became 5-on-4 and the Stars were able to essentially run their league-leading power play. Morin agreed, "Coming out 5-on-4 is a little easier than 6-on-5 with fewer guys out there." Justin Dowling dished to Travis Morin on the backdoor for the quick reaction goal. It was Morin's second of the game, second of the playoffs and second to come in the final minute of the period. The Stars would need overtime to settle this one once again. Several frenetic minutes in the Texas zone saw Texas goalie Jack Campbell leap across his crease to protect an empty net. The Stars bent but did not break. Brendan Ranford was the hero this time with five minutes left in the OT period. He wrapped around the net clockwise to beat Richard Bachman to the post. Initially, even he didn't realize he had scored. The referee's demonstrative arm motion sent the Stars flooding onto the ice to celebrate the win. The Stars are back in action with a chance to seal up the series on Wednesday at home. After falling behind 2-0 in the second period of the last game, the league's top overall seed managed a three goal comeback that culminated in Mike Hedden's game-winner in overtime on Wednesday. In most realistic interpretations of these 2-3 series, it is considered a pretty acceptable outcome for the higher seed to split on the road and come home to close it out. Texas has that one game. They can put the series in their full control heading back to Cedar Park with a win tonight. Scott Glennie was suspended a single game for his boarding incident in Wednesday's game. He will be unavailable tonight, leaving a gap in the lineup. Steve Pinizzotto was also suspended on the Barons' side. He picked up two games, leaving a hole in their lineup as well. Glennie's absence puts more pressure on the possible return of Brett Ritchie. The rookie Ritchie has been out with a lower body injury and was questionable for Wednesday but did not play. ATO forward Derek Hulak did not make the trip with the team due to injury. Branden Troock or Alex Guptill will enter the lineup if Ritchie cannot play. If he figures into the lineup tonight or at any time in the series, it changes the game. Richard Bachman looked to be having 'one of those games' that Stars' fans are familiar with early in the hockey game on Wednesday. Texas eventually wore him down but it serves as a warning that the Utah native goalie can be a big difference maker. And on the topic of goaltending, Texas coach Willie Desjardins was extremely cagey when speaking with the Austin American-Statesman this week. After going with Nilstorp in Game 1, he would not commit to Nilstorp or Campbell for Game 2. Desjardins alternated the starters the entire month of April, going 5-1-0-1 in the regular season. In some ways, why fix what isn't broken? Jack Campbell might start. We'll know in the morning. Texas Stars forward Scott Glennie, not usually a rough and tumble type player, has been suspended one game as a result of his boarding call in Game 1 of the Stars' series against OKC. The first-round pick was assessed two minutes for the boarding penalty in the game. 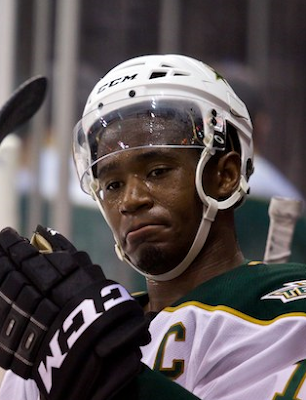 He was then taken to task by fellow first-rounder and ATO player Darnell Nurse, earning five each for fighting. Losing Glennie puts a lot of pressure on the Stars to get Ritchie back in the lineup. Ritchie has been out with a lower body injury and could play this weekend if healthy. Without either, Texas will have to bring either Brenden Troock or Alex Guptill into the lineup. Both Dallas draft picks are on ATOs. The other potential forward fill-in, Derek Hulak, did not travel with the team. He is injured. Steve Pinizzotto was also suspended for a boarding incident later in the game. He received two games and will miss both Saturday's and next Wednesday's games. The American Hockey League today announced that Oklahoma City Barons right wing Steve Pinizzotto has been suspended for two (2) games and Texas Stars right wing Scott Glennie has been suspended for one (1) game as a result of their actions in Game 1 of the Western Conference quarterfinal playoff series between the teams on Apr. 23. 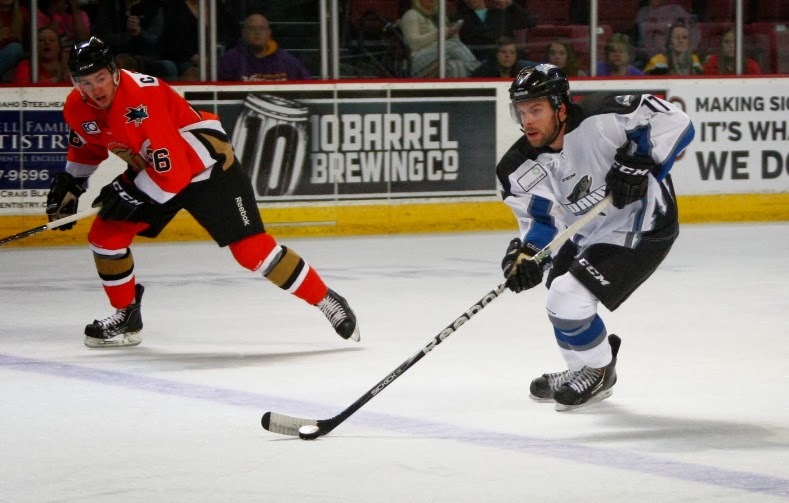 With little room from error, the Idaho Steelheads offense finally woke up as they produced four different goal scorers en route to a 4-3 victory to tie the first round series at two games apiece and guarantee a return trip to Idaho for Game 6 on Monday. 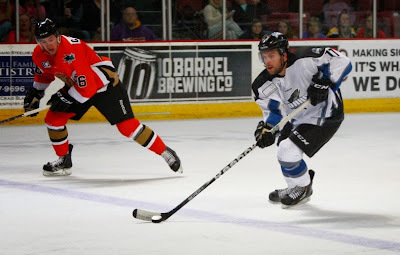 Coming into Game 4 of the first round series between the Idaho Steelheads and the Colorado Eagles, I was curious as to what Head Coach Brad Ralph could do or was willing to do to provide a spark for Idaho. Through three games, every able body on the Steelheads roster had seen ice time except for one. That is not the case anymore. In what could be seen as a shocking move, although to yours truly it was a little less of a surprise than you would think, Ralph switched goaltenders opting to go with Pat Nagle over Josh Robinson for Game 4 between the pipes. The switch had absolutely nothing to do with Josh’s performance of the first three games. His numbers through three games were 2.03 GAA and a .943 save percentage. He has only allowed 6 goals on 106 shots. Those 106 shots faced were enough to rank him second in shots faced when compared to other goaltenders who have played a similar number of minutes. This was a move designed to shake up the team in front of the goaltender and to get them to play differently or with a different mental mindset. If you are looking for psychologist Mulhern, you’ve come to the wrong place. I won’t be able to tell you what could have changed on Thursday night, only that it did change, and it worked out for the best. Nagle would end up stopping 24 of 27 shots (the lowest amount seen by an Idaho goaltender in the series) on the way to Idaho’s series tying 4-3 victory. His biggest save of the night might have been his first one, when just 10 seconds into the game Luke Fulghum tested the glove hand of Nagle. Nagle would pass that test with flying colors and away we went. In game 3 of the Western Conference Quarterfinals, the Idaho Steelheads did a better job at reducing the shots the Colorado Eagles were able to put on net, but in the end, the Eagles were able to find the back more often than the Steelheads. The Eagles took a 2-1 series lead with a 4-1 win. The Steelheads finally got some offense beyond David deKastrozza, who had scored all of Idaho’s goals in the series previously. Brett Robinson was able to give Idaho the lead towards the end of the first period, but that was all the scoring in the first period. Colorado would then proceed to score the next four goals to finish off the scoring. Honestly when it comes to game action there really isn’t a whole lot to go over. Colorado played great defense and continued to shut down just about all of the Steelheads offense. Idaho did a better job of trying to play the game in the offensive zone but was only able to muster 21 shots for the game. Only six of those came in the third period. But a bigger look at the third period shows a lot more shots headed in the direction of the goal, but a lot of them missing just wide, or blocked by Eagles defenders as they continue to pack in around the net and sacrifice the body to keep the pucks away from goalie Dustin Butler. A quick look at the Steelheads also shows a lot of solid defensive play. Colorado only put 29 shots on net, and the goals that they scored were primarily on chances where they were just able to outwork, get better position and find a way to beat Josh Robinson. While on the topic, Robinson continued to play well. The problem is that he no longer Super Goalie. He is playing well enough to win games when the offense for the Steelheads is clicking. Unfortunately that is just not happening at this point. Overall, the Steelheads only trail in the series 2-1. While all Steelheads fans would prefer the series to be 2-1 with Idaho in the front, one good sixty minute effort could truly turn the series in the other direction. Either way, one more win gets the series back to Idaho for at least game six. This team has too much talent and Brad Ralph is too good at pulling the right strings for this series to not make it back to Idaho. The turning point of the game three loss was a five minute major and misconduct called against Steelheads forward Andrew Conboy in the second period. He was assessed the penalties for a cross check. Idaho was able to kill off the major penalty, but there was a momentum shift. From there on, the Steelheads had to play the rest of a game without a full complement of forwards. The ECHL plays a three official system, even in the playoffs. The assigned referee for the game was Andrew Wilk; however, it was not Wilk that made the penalty call. It was linesman-turned-referee Butch Mousseaux. Wilk was caught up in a collision along the half wall about halfway through the first period and left the ice leaving just the two linesmen to officiate the remainder of the first period without orange arm bands. During the first intermission, Mousseaux came out with the arm bands and would officiate the remainder of the game. Herein lies the issue I have with the set-up for this game. Will Hoenike and I have been in agreement for at least the past couple of years that in an optimal scenario each ECHL game would have four officials (two refs and two linesmen). Of course for one reason or another that hasn’t happened and I can offer reasons as to why that hasn’t happened but that would all be conjecture. However, when it comes to the playoffs, why can’t the league provide two referees to all of the playoff games? It would take adjustments from the teams come playoff time, but it would make for a better product. Short of that, why not have an extra ECHL official available in case the assigned referee gets hurt? It is my understanding that Mousseaux has been a referee at other levels, but to the best of my knowledge he has not been the referee during an ECHL game this year. There was no video available on the broadcast to show whether or not the major and misconduct were warranted, but I would be more confident and accepting of that call if it was a regular ECHL official. That one call definitely changed the complexion of game 3 and may have changed the complexion of the entire series. Where things go from here has yet to be determined and if the call isn’t made, that doesn’t automatically mean the Steelheads win that game. The overriding point of the last couple of paragraphs is to point out that the playoffs are where you figure out your champion. You get more attention in the playoffs than you would get for just about any single regular season game. Why not put a little more money and treat the playoffs games with just a little more respect than the regular season? Make sure that whether you have 3 officials with 1 in reserve, or go to 4 officials for a whole game, you do your best as a league to put your best foot forward to make sure you have a fair and equitable outcome to every postseason game. This is what the playoffs are about. Gritty come from behind wins in the other guys' building are par for the course. Tonight, Texas got just that thanks to Mike Hedden's OT goal 5:35 into the extra frame. After falling behind 2-0 in the second period, the top-seeded Stars had to fight back with three unanswered goals to win things in overtime. Derek Meech opened the scoring on the power play, and Mike Hedden got the other two for the 3-2 final. Cristopher Nilstorp got the start and stopped 26 of 28 shots against him. He was named the game's second star. Texas leads the best-of-five series 1-0. The Barons stormed out of the gate with all the momentum. The home side generated eight shots in the first eight minutes of the period to Texas's three. Cristopher Nilstorp kept the Stars in it. It looked like the club caught a break on the penalty kill as Brendan Ranford had a shot called a goal with Scott Glennie in the box. Further review indicated that the puck rode the crossbar left to right and never entered the net. Despite a second half of the period that saw the Stars draw near even in shots at 9-8 OKC, there was no score after one. Former Texas Stars Austin Fyten opened the scoring in the series with a play that probably never should have made it past the hashes. Fyten charged down the right side and scored a very similar goal to Mikael Granlund's OT game winner in Minnesota two nights ago. Cameron Gaunce did not step up on the play and allowed Fyten to slip behind him and go one-on-one with Nilstorp. OKC went up 2-0 just five minutes later as Curtis Hamilton picked a corner on Texas. Bachman was looking to be the story of the game through 30 minutes. Texas earned a power play as the period wore on and made it count. Derek Meech got a shot off from the right point, squeaking one through Bachman with Dowling at the net to cause havoc. Brendan Ranford had the second assist on the power play goal. The Stars would have to kill two short 5-on-3s among nearly six minutes of penalty kill time to end the second. That helped the Barons draw to even on the shot count at 23-23 after Texas led earlier in the frame. Needing their best players to step up, Mike Hedden took the charge. Scott Glennie dished to the third-year Star on the right wing. He bore down on Bachman and beat him up high over the glove for the two all score. Texas would get a final power play in the third period but come up empty. Hedden ended up the overtime hero off the wraparound from Dowling. The initial play pulled Richard Bachman out of position and allowed Hedden to roof the rebound. These two teams are back in action Saturday. Welcome to the 2014 Calder Cup Playoffs. It's been a long slog to get here. Training camp in Dallas, training camp in Texas. Preseason in Dallas, preseason in Texas. For some, preseason and training camp in Idaho as well. 76 games of a regular season that saw these Texas Stars finish with a franchise-record 106 points. League MVP, rookie of the year, division champs, conference champs, league champs. Checks all down the list. Best home record, top five road record. Franchise record 12 game home win streak, 11 game overall winning streak, and 13 game point streak. Yup, got all those. Alright, now take all of that and put it in the rear view mirror. Texas certainly is doing just that. After last season's 4-1 series defeat at the hands of these same Oklahoma City Barons, the Texas Stars know that there is nothing handed to them for having the number 1 by their name in the standings. It was seemingly inexplicable for the Stars to lose out to the Barons after the season they had last year. If you want a recap of how that felt, read my Game 5 postgame from last year. More reading on that series here and here. I think the Stars are going to need some of the things that bit them last year to turn the other way to win this series. Last year it turned out that five of the top six forwards were battling some sort of injury in the series. Right now with some time off over the last two weeks, it looks like Texas is mostly healthy. The health of Brett Ritchie is the biggest question mark for the club. He definitely slots in with Justin Dowling and Mike Hedden if healthy. If not, that's a 48 point player out of the lineup and one who has been red-hot at times in the year, having a seven game point streak snapped by the shutout in San Antonio two weekends ago. This goes both ways though. Mark Arcobello has 10 goals and 18 assists on the season in just 15 games played. He hasn't suited up for the Barons since March 15th though, due to a shoulder injury. Multiple sources have reported on Twitter that Arcobello could be in for Saturday's Game 2. All the more reason for Texas to make sure they are geared up for tonight's game to pounce on a club lacking a big threat on offense. The Barons will also be missing newcomer defenseman Darnell Nurse, who will also be a possibility to return on Saturday according to Coach Nelson. Last year Matt Fraser had zero points in the series against OKC. Chiasson had just one, an assist on the meaningless final goal of the series to make it 5-1 Barons. This season, Travis Morin, Curtis McKenzie and the aforementioned Dowling, Ritchie and Hedden are the top active scorers in the season series for Texas. If they are successful, Texas is successful. If not, well, the Stars have a pretty good basis of secondary scoring. However, a series where those five players are severely limited in their offense is not one the Stars would be favored to win. Last year, Yann Danis had the Stars' number. The Stars were outscored 16-4 in the Cox Center. Cristopher Nilstorp wasn't really to blame for the score against either. Texas wasn't giving him a lot to work with on defense. Rebounds were the order of the series and blue liners were not clearing out Barons skaters or the puck. This year, despite having nine goaltenders on the roster over the season, Coach Desjardins believes the Barons have had the 'most stable' goaltending in the league thanks to former Star Richard Bachman. In 52 games, he had a worse than usual 2.99 GAA and 0.908 SV%. However, it was his consistent effort that gave the Barons 26 of their 36 total wins on the season. Against Texas, he is 4-5 this season in nine games with a 3.11 GAA and .916 SV%. On Texas' side, any word on the goaltending decision is locked up tighter than Fort Knox. Jack Campbell is 2-0 against the Barons this season; Nilstorp is 5-3. Campbell is 12-2-2 this season and has been otherworldly at times for the Stars. Then again, Nilstorp hasn't lost in regulation since February 17th. We probably won't know anything until tomorrow's morning skate. Starting on the road is of course less than ideal, but to a man the Stars said that those were the cards they were dealt. Their job is to show up and win the games, regardless of time, place, or circumstance. Texas holds the season series advantage at 8-3-0-1. However, as I said at the top, none of that matters anymore. It's playoffs. Both teams should look to stay out of the box, as OKC has the third best power play in the league. Texas is first. The PK stats might favor Texas if it comes down to it though. The Stars are third best in the league overall and on the road. OKC is fourth worst at home and third worst overall. Maybe if Texas can goad overall PIMs leader Pinizzotto into taking some undisciplined penalties, that would work to their advantage. Texas signed Dallas second round pick and goaltender Philippe Desrosiers to an ATO. He will play the black ace role for Campbell and Nilstorp, getting a feel for the team and giving them a break in practice. He won't play. I'm going to remove Colton Sceviour from the call up list for good. If you want more explanation why, read this. I feel like this is a topic that is going to come up a lot, so I need to write something that I can refer people to in the future. 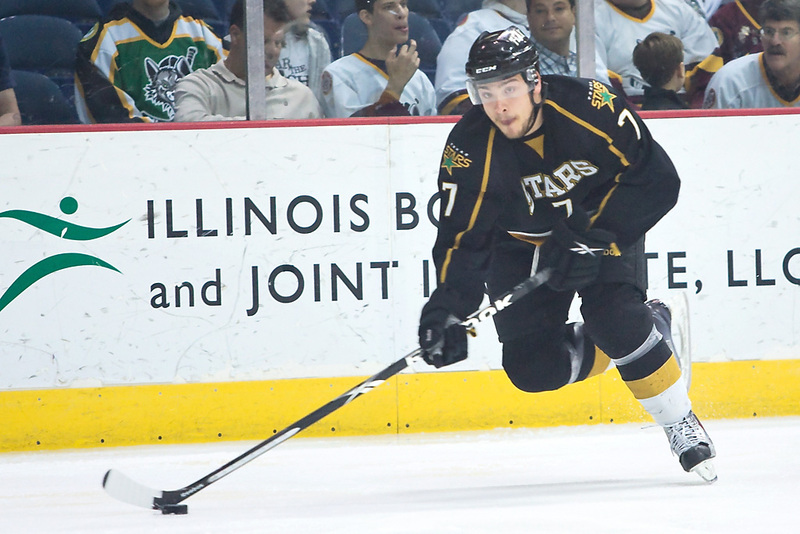 Colton Sceviour is the games played leader all-time for the Texas Stars. He is tied with Morin for goals scored all-time at 99 and somewhere in the top five in most other meaningful offensive categories. After an All-Star season in the AHL, he was recalled to the NHL to play for Dallas. He earned himself a two-year one-way deal with the NHL club, and he's got a goal and two assists in the NHL playoffs. And no matter how much he might be worth as an assignment to the Texas Stars, he won't be joining the team if the Dallas Stars finish their playoff run before Texas. The reason why is his waiver status. If Sceviour were to be sent down, he would have to pass through NHL waivers. 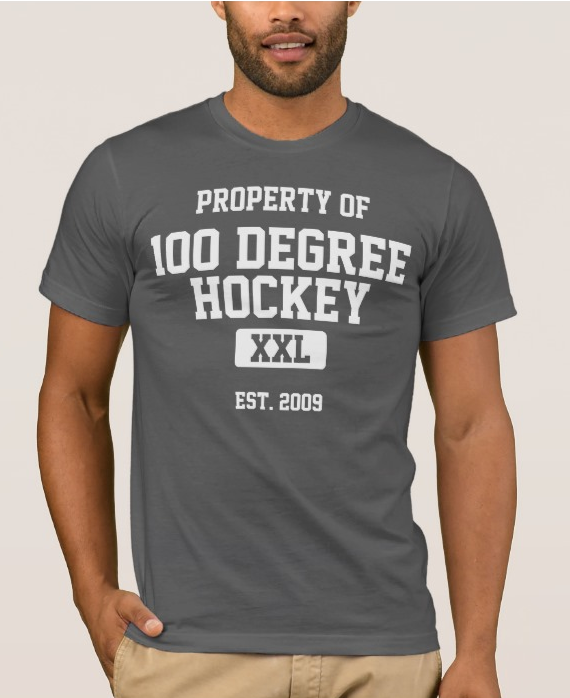 You can read more about those in the 100 Degree Hockey Glossary. Put yourself in the shoes of another team. If you had the chance to claim a player like Sceviour at the price he is being paid ($600k in year one and $700k in year two), wouldn't you jump at it? He has three points in three NHL playoff games. That's a pretty good value. Now put yourself in Dallas's shoes. Would you risk losing Sceviour to another organization to send him down? There's almost no way he isn't claimed. For those reasons, Colton Sceviour is a Dallas Star, regardless of how the NHL playoffs go for Dallas. Period. Dallas and Texas will have to have a conversation about the health of the players when Dallas's run ends, according to Coach Desjardins. However, Chris Mueller, Dustin Jeffrey and Patrik Nemeth are all eligible for assignment. Mueller and Jeffrey must pass through waivers. Making a claim on either of those two is not a smart play for another NHL club, since they are both free agents on July 1. Claiming them would do nothing but prevent them for playing for Texas in the playoffs. Sports are cut-throat but teams wouldn't give up their waiver spot to do that. Patrik Nemeth is waiver exempt as a second year player. Draft day came and went for Texas Stars captain Maxime Fortunus in 2001. The La Prairie, Quebec, native led his major junior squad in defenseman scoring that year and helped them to the second round of the QMJHL playoffs. 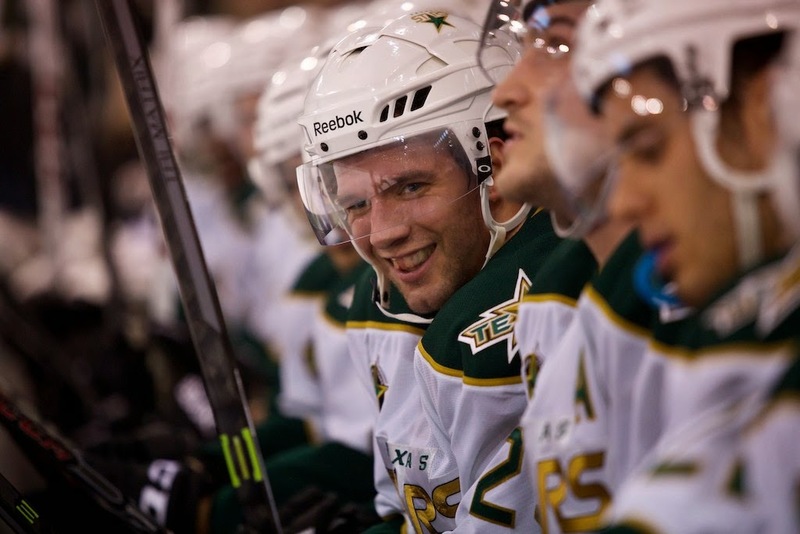 The fifth year Texas Star, a member of the original squad back in 2009, has taken a step-by-step approach and gotten his chance at the NHL with the Dallas Stars organization while leading his AHL club to the league’s best record. Fortunus’s long and winding road to where he is today started in 2003 in Lafayette, Lousiana, with the ECHL’s Lousiana IceGators. As the Lone Star state's hockey attention turns to the American Airlines Center this evening, the Texas Stars also held playoff media day today. With TV in the house, the questions were mostly generic things that readers of this blog and frequent visitors to the Cedar Park Center have heard asked and answered before. Coach Desjardins would not name a game one starter in net. He has always stated that he likes to pick one guy and go with him. This season, however, Cristopher Nilstorp and Jack Campbell have been so good that he has had to alternate starts between them. Nilstorp hasn't lost in regulation since February 17th. Before last Saturday, Campbell hadn't lost in regulation since March 12th. They are both playing amazingly well this season. What's the edge? Nilstorp was in net for the elimination against OKC last season and is 5-3 against them this year. Campbell is 2-0 this year against OKC. I don't think we'll know until morning skate on Wednesday. Coach Lidster said definitively that defenseman John Klingberg is 'out' at this time. He could probably help this team in the playoffs after what we saw from him late in the season, but it is overall better for him to make sure his injury issues recover and nott o push it. Texas has seven defensemen without Klingberg. Depending on how Dallas' series goes, they could add Nemeth by the end of the first round. Lidster pointed out that Nemeth was obviously in Dallas for a reason and that his return would make a strong D corps that much stronger. Derek Hulak was participating in practice but was still in a red no-contact jersey. Brett Ritchie was not in the building and is apparently on crutches. No word on his return potential. With regard to potential return of Mueller, Jeffrey and Nemeth, Desjardins indicated it would be more of a conversation than an automatic assignment, based on their health. Curtis McKenzie does not think he is the right person to babysit for Travis Morin. Also he feels assistant equipment manager Jorge Lopez is the X-factor in the playoff run. Seriously though, it's McKenzie's first pro playoff run where he will be getting into games. He is excited to get away from the college one-and-done format and play out longer series and excited to play after acting as more of a black ace last year. 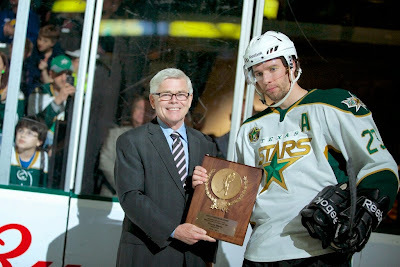 AHL president Dave Andrews hands out the AHL MVP Trophy to Travis Morin. With the Texas Stars earning a total of eight end-of-season trophies, the American Hockey League commissioner and president, Dave Andrews, was in town to present the trophies and plaques. It was also a chance to talk to the league boss about many of the topics swirling around the AHL these days. He had thoughts on the potential west coast relocation of many teams in the league, the future of hockey in Houston, the potential for an All-Star game in Cedar Park, advanced stats in the AHL and a very interesting take on the future of five-game playoff series. Since the last time I spoke with Andrews, the league has been rolling strong with thirty teams for four years now. Andrews said it was a long-time goal to get to thrity teams in the league and matchup one-to-one with the National Hockey League. "It's probably more important for the NHL for every team to have a full development system, which they did not have until we got to 30 teams. When you look at the numbers in the NHL, we're close to 90% of the players who have come through our league. This year alone, we've had 360 players called up to play." "One of the stats I looked at recently, I think we've had 6,000 man-games played by AHL recalls in the NHL [this year]. If you think about that, it's a lot of games played by AHL players, which points to the need to have a good deep system for every NHL club. We are fortunate to get the best players outside the NHL, and they are playing hard to get to that next step." 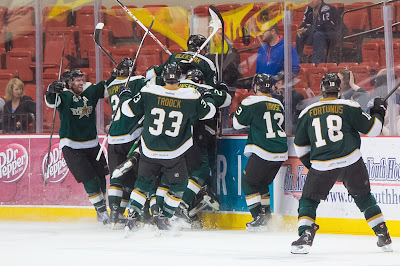 To the point of each team having its own deep development system, Andrews feels that the Texas Stars are one of several model franchises in the league with regard to geographic setup. "This is one example of how well it can work. There are other examples in the league if you look at Toronto or Providence and Boston. It is an advantage for an NHL team to have their players close"
With the recently announced departure of the Heat from Abbotsford, conversations have again popped up regarding the league's potential to create a Pacific or West Coast Division to create a situation more like the Dallas-Texas connection for teams such as Los Angeles, San Jose, Phoenix and Anaheim. "There is a fair amount of truth behind [those rumours]. At the same time, there's a lot of conjecture that isn't accurate. We have been involved in a process over the last two years or so starting with eight of the NHL teams that are Western based moving down to about five of them that are active right now who are looking to get closer to the Pacific coast at some point. Recently, it's heated up again, and we've been looking at what the process will be and how it might take place and the timelines." "We still haven't identified markets, and neither have they in terms of where they would like to place teams on the west coast. We haven't really understood what the timeline is likely to be. We're closer to it happening, but we're not sure when and if it will happen. There are a number of hurdles. We're not going to create more AHL franchises so to relocate five at one time or more perhaps is a very significant challenge. I would say there's half-truths in some of those stories and half wishful thinking." Further, Andrews does not feel like adding a West Division will have to necessarily restrict scheduling. AHL scheduling is already heavily rivalry-based. No team plays every other team in the league. The goal for the AHL office is to put together a schedule that is best for player development and that ownership believes is best for their business interests. Regarding travel, the Texas Stars certainly would have an easier travel schedule if it weren't for the departure of the Houston Aeros this past offseason. Unfortuantely, Andrews does not see a future for AHL hockey in Houston right now. "I would love to say that we saw a future for the AHL in Houston. In order to do that, we need a facility that we can play in. As I'm sure you know, leaving Houston wasn't high on the list of priorities. Houston was one of our most successful franchises in the league. The three teams in Texas have been really successful over the last number of years, so to lose one of the top franchises and move them out of Houston was not something the Minnesota Wild or the AHL wanted to see happen. We didn't control the building. The Houston Rockets do, and they determined that they didn't want a professional hockey team in the building. " He was also able to add some color to the contingency plans the Wild explored to keep the team in Houston. "The Wild looked carefully for other sites that they might be able to use, including one of the rodeo facilities and trying to retrofit that as a hockey arena. It just wasn't viable. Would we like to be in Houston if we could find a 7000 or 8000 seat building in Houston? We sure would. It would be great for the Texas Stars, and it would be great for San Antonio as well. I don't know that that is on the horizon." Expanding the five-game series to rounds two and three? The Stars are preparing for a playoffs series that will see them start on the road in OKC despite winning the league's best overall record. Andrews talked through the economics of the decision, which has less to do with travel costs than you might think. Moving to [first-round] best of five was a decision that was made two or three years ago. We reduced our schedule to a 76 game schedule, and in doing so we expanded the length of the season to try to recapture the revenue by getting more weekend dates. In doing that, we obviously pushed ourselves back further than we wanted to be from a playoff point of view. So the way we recapture that time was by moving to best of five in the first round." The American Hockey League ends their regular season a full week after the NHL and ECHL, which does put pressure on the league to catch up with the other two. 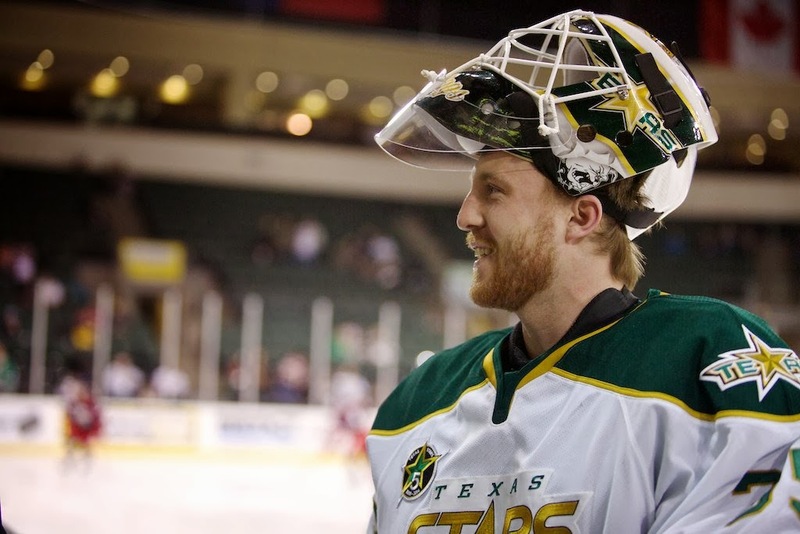 The Texas Stars are a good example of the weekend date revenue bias that Andrews mentions. In Sunday through Thursday games this season, Texas averaged just 4,603 fans. On Friday and Saturday, they greeted an average of 5,697 fans. Andrews actually sees the league moving to more five-game series in the future. "If I were looking at what I think the future holds for us, I would believe that we may play shorter rounds in the playoffs in the future in the second and third rounds. I don't think you'll ever see it in the fourth round and probably not the third. There's some sense that a best of five second round may make sense as well. We've had good success with the first round playing mostly weekend dates. Playoff sales are tough. We don't have a lot of lead time to sell. It's challenging for our teams. Fewer games and better dates is always a good format." When asked about the potential for an All-Star Game in Cedar Park, Andrews put the pressure on Rick McLaughlin, who was standing nearby in the room, smiling and saying, "I think Rick would really like to have an All-Star Game." On advanced stats, Andrews noted that league VP of PR and communications, Jason Chaimovitch, is a huge stats geek and would love to get the league more involved in those things. He added, "I expect that most people who are diehard sports fans connect with stats, trying to analyze the game and understand it in a better way. As that begins to unfold in hockey in a more meaningful way, I'm sure we'll try to be a part of that and participate in it." Now that the season is over, Travis Morin can lay claim to one more award, the John B. Sollenberger Trophy, as the leading scorer in the AHL. Morin finished the year with 32 goals and 56 assists for 88 total points. He was also named the league's MVP on Friday. Morin has led the league in scoring from Game 1 to 76 after putting up four points in the opening night game against Chicago. Fellow Texas Star Colton Sceviour led the league in goals for a time before his recall to Dallas allowed Charlotte's Zach Boychuk to overtake him for the Willie Marshall Award. It is the second time that a Texas Star has finished second in league goal scoring. 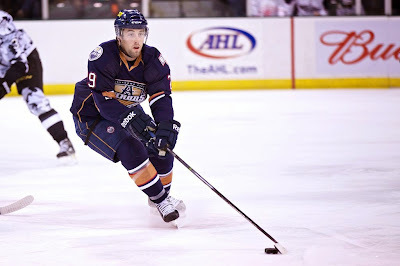 In 2011-12, Norfolk forward Cory Conacher scored a hat trick in the final game of the season to pass Texas' Matt Fraser and beat his goal total by two. 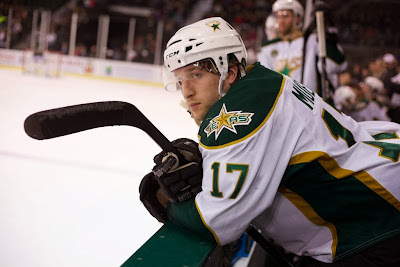 The Texas Stars, proud American Hockey League affiliate of the Dallas Stars, announced today that center Travis Morin has won the John B. Sollenberger Trophy as the leading scorer in the AHL. Morin, who was voted the winner of the Les Cunningham Award as the AHL’s most valuable player this season, led the league in scoring wire-to-wire after notching four points for Texas on opening night. He finished with 88 points (32 goals, 56 assists) in 66 games played for the Stars, doubling his 44-point output from a year ago and helping Texas to the best record in the AHL. The CCM/AHL Player of the Month in both October and January, Morin began the season on a 10-game scoring streak and went without a point in consecutive games on just four occasions all year. A 30-year-old native of Brooklyn Park, Minn., Morin also appeared in four games with the Dallas Stars this season, picking up an assist for his first career NHL point. In 350 career AHL games with Texas and Hershey, Morin has totaled 99 goals and 197 assists for 296 points. Despite another outstanding night in net for Idaho Steelheads goaltender Josh Robinson, the Colorado Eagles increased their physical presence to even the best-of-seven first round series at one game each as the series shifts to Colorado for game three Tuesday. Goals from Kevin Young and Trent Daavettila in second period were enough for the Eagles to get a 3-1 win. David deKastrozza got his third goal of the series for Idaho. He is the only Steelheads player to find the back of the net through two games. Colorado seems to have had the better of the play over the first two games. Outside of the first ten minutes of the first period of game one and the better part of the third period in game two, Colorado has been able to get the puck into the Steelheads zone and control attack time and puck possession. 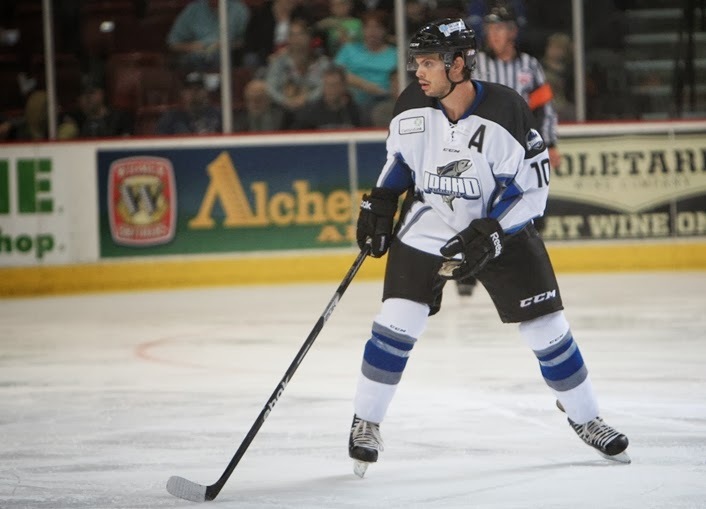 Colorado also made a concerted effort to increase some of the post-whistle activity in game two and for the most part the Steelheads were able to skate away and avoid any penalties. Referee Nic Leduc did a decent job of keeping things under control only and calls (or non-calls) have not been a factor in the series so far. It will be interesting how things play out as the series changes cities and most likely referees. Will the teams be given the latitude they had in Boise, or will it be a more tightly called game? I don’t think it is unfair to say that without Josh Robinson in net, this series could very well be 2-0 in favor of Colorado. But I also think it is fair to say Idaho has done a great job keeping a very explosive team off the scoreboard. It is also missed a chance for the Steelheads to be up 2-0 in the series as well. This has been an evenly played series so far and from the look of things, six or seven games is looking more of a certainty than anything else at this point. The thing I always end up having to remind myself of after a team’s first playoff loss is that a team is not going sweep its way through the playoffs. They are going to lose and to over-react would be to blow one game out of proportion. In front of a sellout crowd, the Texas Stars finished up their regular season schedule with a 4-3 loss to the visiting Abbotsford Heat. The Heat jumped out to a 3-0 lead in the first, which Texas matched by the third with three of their own. Corey Locke had the game winner int he final frame for the 4-3 win. "They came out hard," said Taylor Vause, who scored his third of the year. "We knew they had a chance to jump up in the standings. That first period was tough for us, and it was good to see our team battle back." AHL President and Commissioner Dave Andrews was in the building to present the Stars with various trophies and league awards in a pregame ceremony. Travis Morin received his AHL MVP award along with AHL First Team All-Star honors. Curtis McKenzie received the Rookie of the year and AHL All-Rookie Awards. Captain Maxime Fortunus accepted the Kilpatrick and Chick Trophies on the team's behalf. 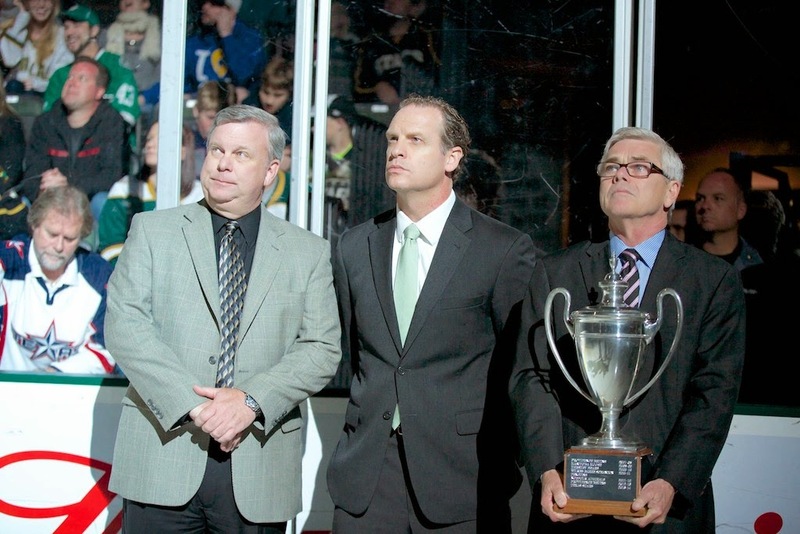 "Having the president come in says a lot," said Coach Desjardins. "It's good to get the praise but you can't live in the past." The long ceremony might have given Abbotsford a bit of motivation to get an early jump on Texas. Coach Desjardins agreed, "When you're the visiting team, it's tough to watch that." It also could have broken up the usual routines guys go through to get ready for the game. "That's never normal," continued Vause. "You get that once or twice a year but you have to pay tribute to guys who had amazing seasons. It's good for our fans to see that. We're so appreciative of them." Texas rested many of its regulars including Derek Meech, Scott Glennie, Mike Hedden and Brett Ritchie. Newcomers such as Alex Guptill and Branden Troock slid into the lineup in their place. "I thought Troock was very good," said Desjardins. "He's a big body and he can skate. He was good when we went through our systems stuff. He was really mature with his questions. I liked what I saw from him." Abbotsford jumped out to an early lead with two Markus Granlund goals. The Finnish product scored off the assist of Poirer and Max Reinhart twice in a three minute span midway through the first. Evan Poirier added a third point on the night was a goal to end the frame and it was 3-0 Heat after twenty. The Stars started the comeback bid on a Taylor Vause power play goal. Vause tipped a point shot from Jyrki Jokipakka for the first goal of the night. "[Playing on the power play] is not something that I take lightly," said Vause. "It's a huge opportunity. If I can step in and make a difference, that's huge." Matej Stransky continued the comeback with a rebound goal off the initial shot from Alex Guptill. Curtis McKenzie evened things up to start the third with his 27th of the year, a diving rebound effort off the initial shot of Morin and first rebound shot of Brendan Ranford. Corey Locke sealed things up for the Heat, who were playing to stay ahead of the Admirals, with his tenth of the year. The quick bang-bang play from behind the net by Blair Jones set up the go-ahead score. Texas would pull Campbell with 89 sesconds left but they would not be able to score despite furious pressure. The Stars will start the playoffs on Wednesday on the road in Oklahoma City. 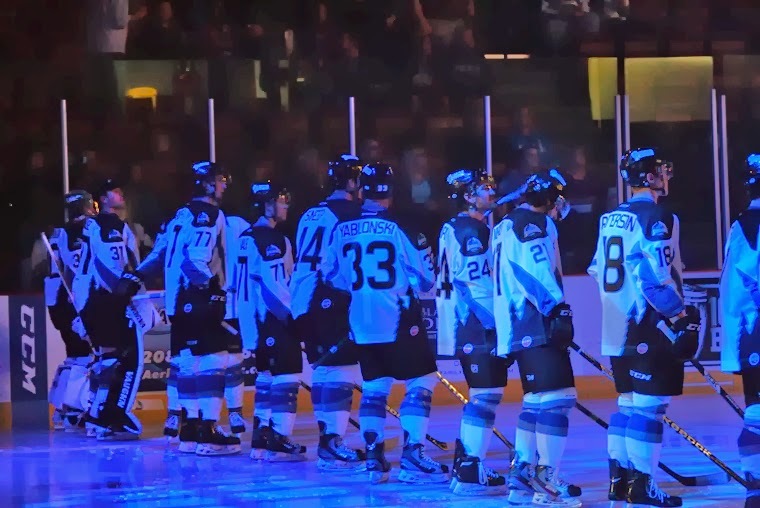 After playing each other seven times in the past month and a half, the Colorado Eagles and the Idaho Steelheads wasted no time getting right down to business. Both teams came out with a lot of end-to-end rushes and a lot of speed. The Eagles would end the first period with the shot advantage 16 to 6, but the Steelheads would have to lead 1-0 after a power play goal. There would be only one penalty in the first period, and it would go against the Eagles Kevin Young. He received an automatic two minutes for delay of game after clearing a bouncing puck over the glass. David deKastrozza, who was promoted to the first power play unit after Tommy Grant had to leave a game after taking a puck to his hand, would get credit for the ensuing PP goal. On a nice passing play between Mitch Wahl and William Rapuzzi, deKastrozza was able to find a spot all alone in front of Eagles goaltender Dustin Butler and was able to bury the pass. Despite the Steelheads getting that first goal, the Eagles were able to carry the remainder of the play and, for the most part, kept the Steelheads bottled up in their own end for the remainder of the period. The Texas Stars have learned this evening who their first round opponent will be. The Oklahoma City Barons, who knocked Texas out in the second round last year, will be that opponent. The series will start in Oklahoma City, likely middle of next week. The Cox Convention Center has some conflicting events that will make Game 2 scheduling difficult. Packet pickup for the OKC Memorial Marathon is scheduled until 8 PM on Friday and 6 PM on Saturday. My personal guess is Wednesday the 23rd (before the Oklahoma Dental Convention starts) and Saturday with a later than usual start (8 or 8:30 PM). 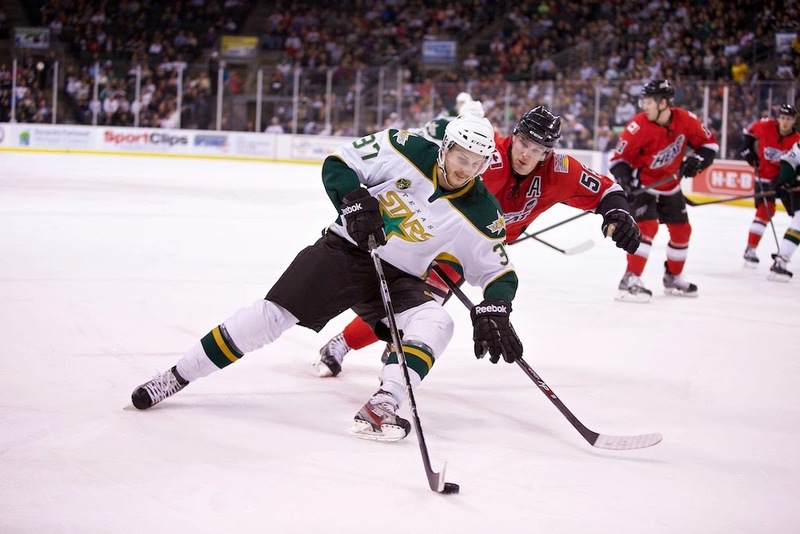 Of the eight first round series, the Stars/Barons matchup is the only one yet determined. Full breakdown of the coming series and a finalized schedule will be coming in the next few days.